Buy: Barnes and Noble | Chapters | Check your local bookstore! This was just the sort of book I was looking to read after finishing Saramago's Blindness. I needed something fun and light; Garlic and Sapphires was just what I was looking for. 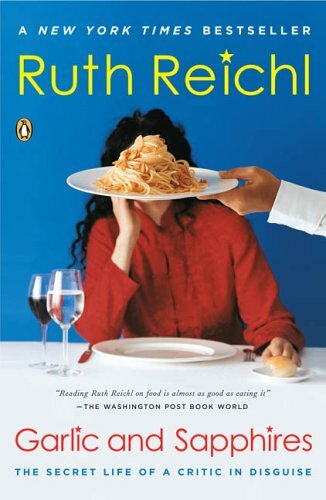 The book is about Ruth Reichl's adventures, you could say, as the restaurant critic for the New York Times in the nineties. I enjoy reading any type of story about New York and this book was no exception. I really liked hearing about the different food cultures of the city, from the fancy restaurants to the local bakeries, butchers, etc. Occasionally I read books about food (I'm hoping this challenge will get me reading some of the ones I should have read awhile ago!) but usually they're books about the behind the scenes of food, ex. books about GMOs. I've never read about restaurants at all before, especially not reviews like those found in the Times so this book was very refreshing for me. I haven't tried any of the recipes in the book (there are 17) but some of the sound very interesting and I will be photocopying them before I return the book to the library. I'm so glad you found the book enjoyable. I loved her honesty in the book and frankly, I just like her writing. I tried the hash browns and the NY Cheesecake recipes which were very delicious. It seems like I tried one more but can't remember. Found this at the Foodie's Challenge. This sounds like a fun read!